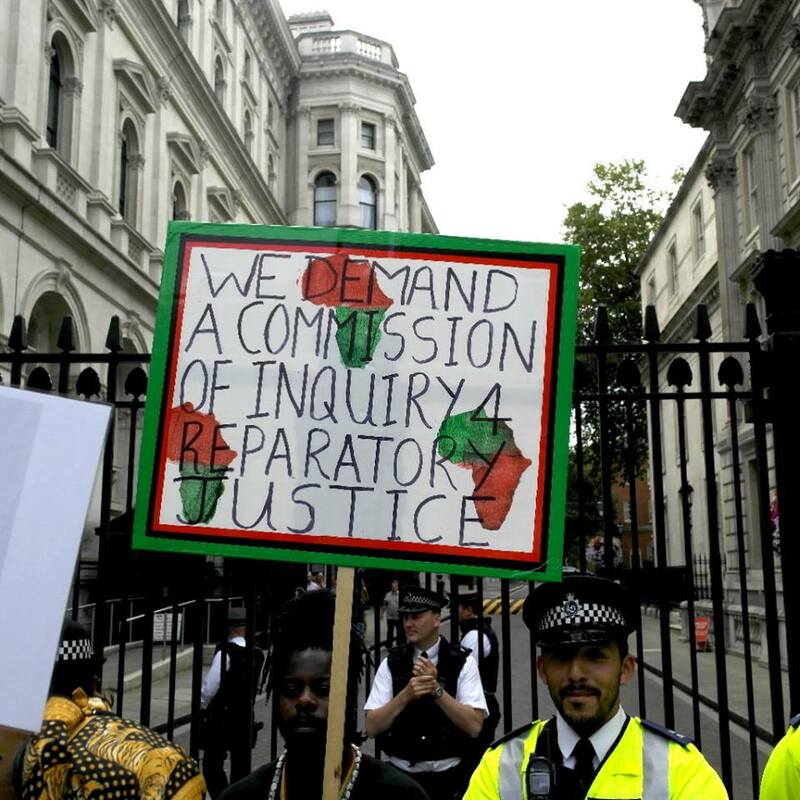 No exact template or model exists for the All-Party Parliamentary Commission of Inquiry for Truth & Reparatory Justice (APPCITARJ) in that it will have to be shaped in a way that meets the needs and aspirations of Afrikan Heritage Communities that have been enslaved, colonised or otherwise oppressed by the British Empire and/or the current British State. However, our vision is that the APPCITARJ will consist of British and European Parliamentary Commissions established with representation from the political parties in these parliaments and thy will hear our submissions as Afrikan Heritage Communities who have been impacted by the Maangamizi (Afrikan hellacaust of chattel, colonial and neocolonial enslavement). This is an example of the revolutionary use of reform in that we are tactically seeking to use establishment institutions and some of their processes to achieve some of our revolutionary objectives for reparatory justice social change and transformation. For us in the ‘Stop the Maangamizi: We Charge Genocide/Ecocide!’ Campaign (SMWeCGEC), this is not about taking our individual and collective cases to parliamentarians for those parliamentarians, on their own, to decide on the merits of our individual/family/people’s case and to make final judgements about what the outcomes should be. In our view, this adjudication function can best be achieved by the establishment of the Ubuntukgotla-Peoples International Tribunal for Global Justice(U-PITGJ) in which representatives of our people and other peoples who have experienced European colonialism, enslavement and genocide become the judges using law from our various people’s legal traditions. Rather, the establishment of the APPCITARJs, at the levels of the Westminster Houses of Parliament and the European Parliament, are a tactic to facilitate widespread evidence gathering which reveal facts about the magnitude of the Maangamizi and for the public dissemination of that evidence as part of the battle to win hearts of minds and influence public opinion to support our people’s cause. It is therefore important for the proposed APPCITARJ to seek an appropriately weighted balance between an individualized approach that places victims and perpetrators at the centre of the process and recognising as well as redressing the impact of the Maangamizi on whole collectivities. However, this requires a focus on tackling the systemic aspects of the Maangamizi and examining the role of institutions, structures of legitimisation and governance in its continuance. In this regard, we are keen to ensure that the systemic aspects of the Maangamizi are no longer hidden from scrutiny or public accountability. Dissemination of such evidence in the arena of the British public will compel the majority of the British public to agree with us that there is an overwhelming case for their criminal ruling classes to answer. In effect, we want our people to have a ‘hearing’ and to speak to the public, (court of public opinion) through the British Parliament. This entails exposing the evidence to the glare of the public and utilising various forms of media who will be reporting on the proceedings to influence public support for our cause of Afrikan Reparatory Justice. According to the 2005 UN Basic Principles and Guidelines on the Right to A Remedy and Reparation for Victims of Gross Violations of International Human Rights Law and Serious Violations of International Humanitarian Law, an essential aspect of reparations include, among other measures: investigation of the facts, official acknowledgement and apology, receipt of answers; an opportunity for victims to speak in a public forum about their experiences and to have active involvement in the reparative process. We are therefore seeking to ensure that our people’s testimonies will bring to light all the gory details that the British public has not been allowed to hear; has been denied true education about; and that we too have not been allowed to narrate on platforms with official legitimisation. This parliamentary and extra-parliamentary process will create the opportunity for a diverse collectivity of Afrikan voices, from all over the world, to speak to the Maangamizi crimes of the British Empire, the British State and its ruling classes, by providing public testimony about our family and people’s case, as we see it. Once these testimonies of ordinary people, as well as the various research and other forms of documentation of the Maangamizi that exists, are being heard over and over again, clarity will dawn on the British public. Ultimately, we are seeking to ensure that our combined evidence, voiced, recorded and reported from the UK and European Parliaments, paints the horrific truth of the culprits crimes. This is an opportunity we have never been given. Once the British public have heard the whole truth, it will be easier for us to win them over to our side; to publicise who the main culprits are ; and elucidate the harm that their deception over the years has done not only to Afrikan Heritage Communities, but also to the British people as a whole. This spark-rippling process will in itself compel the majority of those conscientious members of the British people to join us all in movement-building to stop the harm and repair the damage being done to themselves, and to others, in their name. So what will be a just retribution in terms of holding such perpetrators to account? One form of retribution is to strip the criminals of their ill-gotten wealth and status (“Expropriate the Expropriators!) and reclaim our wealth for Reparatory Justice Redistribution. A large part of our people’s case for compensation is that this is unjustly obtained intergenerational wealth includes the wealth that which we as Afrikan Heritage Communities, are historically owed and have been denied, in addition to what is being stolen from and owed to our contemporary generations. We therefore advocate that we must have out of that redistributed wealth, all that we need to repair our own selves i.e. Afrikan Community Self-Repairs*. Although, we concede that the majority of British people deserve some of that wealth from their ruling classes in terms of wealth that has also been stolen from them over the years. Practically, this is how we see that external compensation in the form of the just redistribution of our people’s wealth will be secured. *Afrikan Community Self-Repairs are the self-determined efforts that need to be made in building our own power, in such a way, that Afrikan heritage communities are able to identify and enhance ongoing work towards stopping the contemporary manifestations of the Maangamizi, which are putting the individuals, families and other social groups that make up our communities into a state of disrepair; as well as reasoning and consciously carrying out the alternative solutions for glocally rebuilding our power base as communities, in such a way that that they are eventually transformed, in accordance with the principles and programmatic demands of Pan-Afrikan Reparations for Global Justice. So for us, the strategic purpose of the APPCITARJ is to divorce the masses of the British public from aligning with their ruling classes in order that they can once again be on the right side of history (as were their abolitionists); in collaborating with us to strip their ruling classes of their ill-gotten wealth and other gains and collaborate with us to secure its redistribution. One of the greatest challenges for transformative reparatory justice change processes and mechanisms is addressing not only the histories of acts of Maangamizi dispossession and violence, but also those of structural violence, where power relations are manifest through the systematic and collective violation/s of economic, social and cultural rights. In many contexts, racialised and otherwise marginalised populations, particularly those of Afrikan heritage, are often systematically excluded from community development initiatives as well as often being denied full participation and substantive Afrikan Heritage Community representation in social, economic and political life. So the way other commissions of inquiry or truth commissions have interacted with ‘victims’ of these harm causing violations; such as receiving testimony, writing histories of victimization in such a way that assists such groups to recover their agency, and recommending reparative approaches – can be replicated with Afrikan Heritage Communities as a collective victim. The 2014 Instance de la Vérité et Dignité (IVD, Commission for Truth and Dignity) in Tunisia pointed the way, by seeking to address the broad range of demands that the Tunisian Revolution made, including not just for truth, but also threats to dignity including issues such as the lack of graduate jobs and the often extreme geographical inequalities that came to the fore in Tunisia under the Ben Ali regime. To address the issue of the collective and structural violence of social exclusion; and for the first time in the history of truth commissions; the IVD defined and implemented the concept of a collective victim as including: “any person who suffered harm following a violation…, be they individuals, or groups of individuals” (Organic law on Transitional Justice). To maximize the impact of collective reparations for Afrikan Heritage Communities requires that such reparations not only address harms, but also the structures and institutions underpinning such harms, and ensure that the such reparations transform the circumstances of unjustly impoverished and marginalised victims. Such transformation occuring in such a way as to address contemporary injustice in its multiple dimensions, (i.e. historical, ethnic, social, political, cultural, religious, sexual, epistemic and ecological). Such injustice being underpinned by ‘cognitive injustice’ which is the failure to recognise the plurality of different knowledges by which Afrikan Heritage Communities give meaning to their existence. It is only by pursuing global cognitive justice that holistic and transformative reparatory justice can become a reality. Hence why in our approach to developing the APPCITARJ, we are cognizant of the need to also adopt approaches, processes, mechanisms and initiatives that incorporate the legal cosmovisions (Indigenous worldviews), ideas and claims of Afrikan people. This in itself, requires a more complete set of tools for building alternatives to the present system of legalized injustice. Among the challenges facing reparations for Maangamizi resistors and survivors, is to differentiate between reparations and the requirement that a state deliver basic public services. Reparatory justice measures will not be secured from others outside of a comprehensive and holistic Afrikan Heritage Community Pempamsie (sewing together) Community Self-Repairs Plan and related policies, which must accompany and shape it. This is why we in the SMWeCGEC, in partnership with the Afrikan Emancipation Day Reparations March Committee (AEDRMC), its allied organisations and other formations, are mobilizing and supporting others to self-organise year-round building on the 2017-2018 Afrikan Emancipation Day Reparations March theme of ‘Promoting the reparatory justice change that we are organising to bring about’ with the 2018-2019 theme: ‘Nothing About Us Without Us: Actualizing the Reparatory Justice Change We Envisage‘! The beginnings of such a Pempamsie Plan were documented in the 2003 Black Quest for Justice Campaign (BQJC) legal & extra-legal Strategy for Pan-Afrikan Reparations for Gobal Justice; and were included in its legal action supported by the Pan-Afrikan Reparations Coalition in Europe (PARCOE), the Black United Front (BUF), the then newly formed Global Afrikan Congress (GAC) and the International Front for Afrikan Reparations (IFAR). In her thesis, ‘Truth Commissions and Public Enquiries: Investigating Historical Injustices in established Democracies’ Kim Stanton asserts that the truth commission is really a specialised form of public inquiry that has developed over the last three decades as a response to historical injustices. To get a sense of what we are envisioning for the APPCITARJ, it is best to understand what a truth commission is. 1. First, they focus on the past and its impact. The events may have occurred in the recent past, but a truth commission is not an ongoing body akin to a human rights commission. 2. Second, truth commissions investigate a pattern of abuse over a set period of time rather than a specific event. In its mandate, the truth commission is given the parameters of its investigation both in terms of the time period covered as well as the type of human rights violations to be explored. 3. Third, a truth commission is a temporary body, usually operating over a period of six months to two years and completing its work by submitting a report. These parameters are established at the time of the commission’s formation, but often an extension can be obtained to wrap things up. 4. Fourth, truth commissions are officially sanctioned, authorised, or empowered by the state. This, in principle, allows the commission to have greater access to information, greater security, and increased assurance that its findings will be taken under serious consideration. Official sanction from the government is crucial because it represents an acknowledgment of past wrongs and a commitment to address the issues. Furthermore, governments may be more likely to enact recommended reforms if they have established the commission. • Creating a collective memory. You can see a list of previous truth commissions here. They formulate recommendations to guarantee the non-repetition of past crimes and reform state institutions involved in the commission of human, peoples and Mother Earth rights violations. It can provide a measure of accountability for the legacies of past and present atrocities and violations/abuses of human, peoples and Mother Earth rights through its findings. There are many factors that will determine the composition and mandate of the APPCITARJ including how much we are able to bring pressure to bear on relevant decision-makers and institutions. There has already been some thinking, analysis, research and consultation on what the purpose of the APPCITARJ should be, although this is an evolving process. determine appropriate methods of dissemination of findings to the public within and beyond Britain for consultation about proposals for redress, repairs and for other purposes. In providing testimony, the so-called victim/survivor becomes an agent, and his/her narrative is especially threatening because it dares to expose violations and violence when others declare that such oppressions do not exist. The APPCITARJ will not substitute a judicial process and is not designed to let perpetrators off the hook. Hence the need for the APPCITARJ to evolve in conjunction with the U-PITGJ. The organising processes towards establishment of the APPCITARJ, including the mobilisational role of the SMWeCGEC, will also galvanise grassroots work towards establishing glocal sittings of the U-PITGJ, as part of a series of actions which will put a full stop, by way of holistic and transformative reparations, to all acts of Genocide/Ecocide against Afrikan people. You can prepare yourself for the APPCITARJ by beginning to do family and community research on how we and our immediate families each have suffered, continue to suffer and have also challenged the various crimes of the Maangamizi. In this regard, see the aims of the SMWeCGEC. Afrikans in the UK and Europe organising towards establishing commissions of inquiry for truth and reparatory justice and local, national and international people’s tribunals to hold the governments of Britain, and other European countries to account. If you are able to gather such evidence you can assist us to arrive at a comprehensive assessment and a full picture of what our journeys and experiences of the Maangamizi have been across the Diaspora, as well as on the continent of Afrika. Each person and representative of families and their communities have to become our own advocates and experts on your own situation and then we can bring all these experiences together as part of us becoming ‘reparations enforcers’ who are building the power and capacity to hold to account all those who are continuing to profit from the ill-gotten gains of the Maangamizi and are also complicit in its perpetuation today. See the video below from the documentary ‘Freedom Summer’ for some APPCITARJ lessons from our Shero Fannie Lou Hamer. Hamer’s testimony had such a huge impact upon the government and public in and outside the USA, and was so powerful, that President Lyndon B. Johnson called an impromptu press conference to get her off the air. This is a recording of the full testimony and also a transcript of that testimony. Her testimony provides an example of what we envisage could be the impact similar ISMAR-coordinated grassroots testimonies by our Afrikan Survivors, Resistors and Challengers of the Maangamizi, from all over the World to the APPCITARJs in the UK Parliament of Westminster and the European Parliament. We surmise that the ‘holding to account’ referred to above can best be done in a collective way by supporting the establishment of the Ubuntukgotla, court of peoples humanity interconnectedness, otherwise known as the Peoples International Tribunal for Global Justice (U-PITGJ), which we encourage you to support the development of. This can be done through hosting sittings of the tribunal, locally, nationally and internationally. As part of the rationale for this approach, it is important to have a better sense of the historical antecedents of the SMWeCGEC in the UK, see these historic recordings from 2003 of Esther Stanford-Xosei, former legal advisor to the BQJC speaking about the BQJC legal & extra-legal strategy for reparations; the need for a UK commission of inquiry to address the legacies of the Maangamizi; and the commencement of the UK version of the ‘We Charge Genocide Petition and campaign’ under the auspices of then then Black United Front-Parliament (BUF-P). The second set of videos where Stanford-Xosei is interviewed, precedes in order and time the first video where she speaks to camera. You can set up a MAATZOEDZADUARA (i.e. Maat action-learning circles or ‘Maat Training Practice Rings’) which is a reparatory justice circle of Maat practitioners who learn to be the self-repairs change at the levels of their person, home, family, neighbourhood, workplace, school, places of leisure and worship, etc. These Maat Training Practice Rings encompass a number of families and lineages, across geographical boundaries and generations. For example, a home or family based Maat Training Practice Ring will entail getting a selected number of people in your family interested in unravelling family histories and using this knowledge to recognise and gather evidence of the harm that has been done to you as a family. The Practice Rings will also explore how such harms have been passed down throughout the generations, resulting in increasing levels of disrepair. We are looking for case studies of some of these family stories documenting family member’s lived experiences of the Maangamizi and resistance to it. This unravelling of these stories is part of the process of repairing the harm and continuing damage being done and passed down intergenerationally within our own families. You can also creatively utilise SMWeCGEC Petition Soulsquestathons (SMWeCGEC-PS), which are literally a collection of souls, for spark-rippling MAATZOEZADUARAs. The aim is to link chains of MAATZOEZADUARAs together encompassing a number of families, across geographical boundaries and generations, all over the place, as Grassroots Afrikan Reparatory Justice Action Learning Praxis Exercising Rings (GARJALPERs) of the U-PITGJ. This means that they will share their stories and practice not only testifying with these stories but also putting their cases through trial rehearsals. The key point about the Soulsquestathons is that the various participants connect to, compare and contrast their self-repairs reparatory justice work as families within these MAATZOEZADUARAs. Basically, these are intergenerational connections, not only of family members of the present, but also the past. It therefore becomes necessary for us to keep records about and bring the lives and work of our revered Ancestors into our everyday lives of the present. If you would like to know more about how to get involved with the APPCITARJ/U-PITGJ or you would like support with setting up a Maatzoedzaduara please contact PARCOE on info@parcoe.com or 07751143043. One of the roles of the APPCITARJ will be to gather statements from Maangamizi resistors, survivors and anyone else who feels they have been impacted by the Maangamizi and its legacies. It is our intention to coordinate the collection of individual statements by written, electronic or other appropriate means such as audio-visual recordings with regard to providing a safe, supportive and sensitive environment for individual/collective/group statement taking/truth sharing. If you would like to begin with compiling your story as a case study or indeed to make a statement about the impact of the Maangamizi, you are invited to contact us to discuss how best this can be done. You can also lobby your local MP and other public elected officials to support the establishment of the APPCITARJ by utilising this SMWeCGEC postcard campaign tool. It is important that you let us know how you get on with your local MP or other publicly elected officials so that we can keep a record of progress or where there is a need for more focused lobbying. Here are the contact details for the SMWeCGEC. Please also see this guidance on Guidance on Proposals for Parliamentary Actions. 1. How best people can be involved and participate in the APPCITARJ? 2. Aims, hopes and fears for the APPCITARJ? 3. Mandate, terms of reference, powers and structure of the APPCITARJ? 4. What are the other ways to deal with the legacies of the Maangamizi and enforce accountability? Support from movement lawyers is welcome! Similar to the different schools of thought in community organising, community lawyering has many different strains. However, what sets lawyers who adopt community lawyering apart from each other boils down to their answers to the following three questions: Who do you work with? What do you do for them? And how do you work together? Similar to community organising, the answers to these questions vary depending on the political orientation of the lawyer and the theory of social change they ascribe to. By combining legal recourse and community organising, it is possible to utilise “community lawyering” as a social change strategy.” This approach engages lawyers who are prepared to de-emphasise litigation as the primary tool for advancing social justice. Instead, community lawyering encourages such lawyers, in collaboration with communities, their groups, activists and organisers, to critically and creatively examine non-traditional forms of advocacy such as facilitative leadership, institution-building, community organising, collective action and other grassroots actions including strategic litigation, media events, community education workshops and public demonstrations. This is done as a way of addressing the legal and non-legal problems of their clients. Community lawyering can also be described as a more participatory process that fosters collaboration between lawyers and their community (group) clients, rather than fostering—if not perpetuating—the dependency that most clients have on their lawyers to solve their legal problems in a conventional lawyer-client relationship. Priscilla B. Hayner, Unspeakable Truths. New York: Routledge, 2001, p. 14. This entry was posted in AEDRMC, ALL PARTY PARLIAMENTARY COMMISSION OF INQUIRY (APPCITARJ), EVENTS/TRAINING, INTERNATIONAL SOCIAL MOVEMENT FOR AFRIKAN REPARATIONS, PREFIGURATIVE POLITICS, REPARATIONS, Reparatory Justice, STOP THE MAANGAMIZI CAMPAIGN, STOP THE MAANGAMIZI PETITION, THE 2017 AFRIKAN EMANCIPATION DAY REPARATIONS MARCH, UBUNTUKGOTLA/PITGJ and tagged APPCITARJ, British Colonialism, British Government, Cognitive Justice, Commission of Inquiry, International Social Movment for Afrikan Reparations, ISMAR, Maangamizi, People Power, Peoples Tribunal, REPARATIONS, Reparatory Justice, Self-Repairs, SMWeCGE Petition, Social Movement, Stop the Maangamizi, We Charge Genocide/Ecocide!. Bookmark the permalink.